A Houston family who lost everything in Hurricane Harvey found out the gender of their unborn baby with the help of some Cubs players on Saturday. 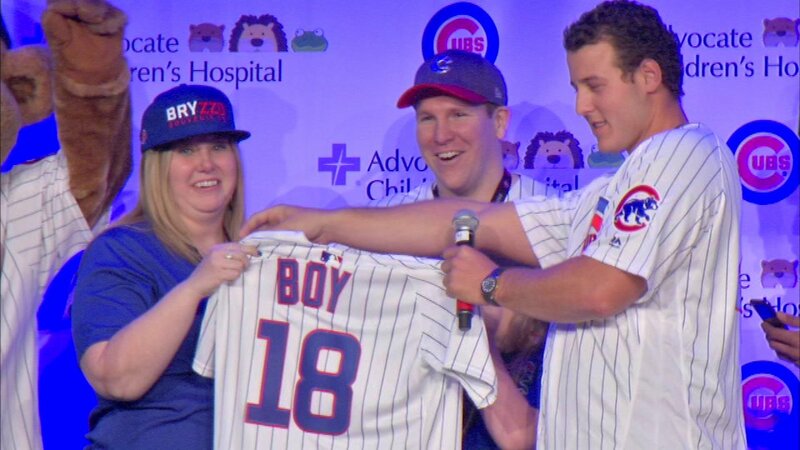 Cubs players Anthony Rizzo, Kris Bryant, Kyle Schwarber and Javier Baez helped with the gender reveal during the Kids Only Press Conference at Cubs Convention. The Carney family, die-hard Cubs fans, bought tickets to the convention to get away from all the re-building. The family already has two children, including 9-year-old Addison, who is named after Addison Street where Wrigley Field is located. They had tweeted at the Cubs a few days before asking for help with their reveal, but didn't know if it was going to happen until they were called onto the stage. The players popped open some confetti and it was blue. It's going to be a boy!